First off, when I first saw this, I thought it was breathtaking. I absolutely love the way you painted the moon. It really creates a texture and adds the creepiness into it and I like that you made it into the painting's focal point. Skullkid looks great and I really like looking at these kinds of paintings because I had to zoom in to actually see all of the detail, which is a very intelligent move on your hand especially if you want the viewer to appreciate the complexities you added to this piece. Would have been pretty neat if you drew Ben from the "Ben Drowned" Creepypasta. 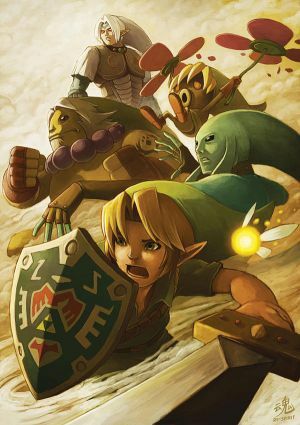 However, I think this is a perfectly done Zelda painting. 20 out of 26 deviants thought this was fair. Loving this. Brings back fond memories from one of my favourite childhood games. 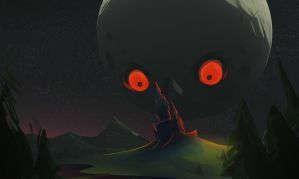 The moon's looking haunting as ever. Well done to you! This thing terrified me as a kid, so I won't be buying a print... I do want to say that, artistically it's brilliant though! 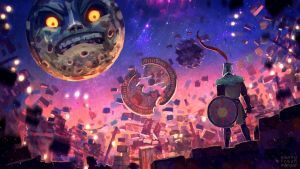 The best of the best: Fan art of Zelda's Majora's Mask. asdfghjklk this looks really REALLY brilliant!! Still one of the best gaming experiences ever. Thanks!